Jack Berry cracked an 89-ball ton for Bourne against Scunthorpe. Jack Berry blasted an 89-ball ton as Bourne raced to a seven-wicket win over Scunthorpe in the Lincs Premier Division yesterday (August 18). Berry struck five sixes and nine fours to finish unbeaten on 101 as Bourne passed Scunthorpe’s 154 all out with 17 overs to spare. Saranga Rajaguru struck 54 for March against Saffron Walden. Photo: Pat Ringham. Berry also took two wickets, but was overshadowed by Tom Dixon (4-38) and Colin Cheer (3-29) with the ball. 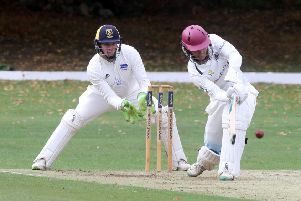 Back-to-back wins have moved Bourne clear of the relegation zone, but Market Deeping are looking anxiously over their shoulders after losing by five wickets at Woodhall Spa. Deeping are just 12 points and one place clear of the drop zone with four matches remaining after mustering just 118 at Woodhall. Mid-table obscurity is the best local Cambs Division One sides Ramsey, March and Wisbech can hope for. The eighth-placed Rams were without a game yesterday, but March (ninth) and Wisbech (seventh) were beaten by title hopefuls Saffron Walden and Foxton respectively. March were 94-2 chasing Walden’s 209 with Saranga Rajaguru (54) and Shardul Brahambhatt (41) both going well, but collapsed to 138 all out. And Wisbech were 125-1 and 174-2 in pursuit of Foxton’s 27-34, but slumped to 249 all out. Gary Freear struck 73 from 70 balls for Wisbech. It was similar story in Division Two as Castor, Stamford Town and Ufford Park were all thrashed. Castor’s match at home to relegation battlers lasted just 30 overs as the hosts were skittled for a paltry 62. Scunthorpe 154 (T. Dixon 4-38, C. Cheer 3-29, J. Berry 2-40). Bourne 155-3 (J. Berry 101no, J. Evison 27). Saffron Walden 209 (G. Ecclestone 55, S. Brahambhatt 3-33, A. Wright 3-47, S. Rajaguru 2-40). March 138 (S. Rajaguru 54, S. Brahambhatt 41). Foxton 273-4 (A. Hooley 98no, W. heslam 67. C. Park 61, G. Freear 2-57). Castor 62 (C. Dockerill 20, L. Hoggett 4-1).